Every year, the Thetford Hill Green comes alive with the sights and sounds of a Medieval village. A King and Queen, knights and ladies, peasants, craftsmen, and farmers gather together to celebrate the age via music, dance, games of skill and chance, authentic food, parades, recitation, and feats of juggling and acrobatics. Won't you join us this year by attending, becoming a sponsor, or both? 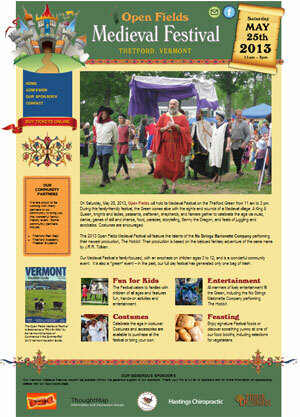 Visit the Open Fields Medieval Festival website at www.VTMedFest.com. Throughout the day, enjoy music, dancing, games, storytelling, food, sword play, demonstrations, crafts, animals, revelry, parades, and a host of colorfully costumed peasants and noble-folk. The Open Fields Medieval Festival was named a 2013 "Pick for Kids" by the Vermont Chamber of Commerce in the Summer/Fall Vermont Vacation Guide. "During this family-friendly celebration, the town center comes alive with the sights and sounds of a medieval village. Come in costume... meet Benny the Dragon, and enjoy feats of juggling and acrobatics. Even teens will go home happy." Come dressed in medieval garb. Bring your own mug and napkin, or rent them at the festival (our last festival generated only one bag of trash for the entire event!). The Thetford Hill Green is located at the intersection of Route 113 and Academy Road, right across from Open Fields School. Visit our Directions page for more details. If you're interested in volunteering or sponsoring this event, please contact us!